The reason why this occurs is because in admin.swremote.com the "Work Authorization Required" and "Credit Card Authorization Required" check boxes are unchecked. Without checking these two boxes, the tech will be able to send invoices and accept payments without signatures. 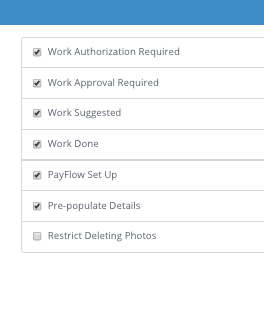 In admin.swremote.com, check the boxes for "Work Authorization Required" and "Work Approval Required" to require signatures when building the invoice. It might be important to ask the office manager if credit cards should require a signature.